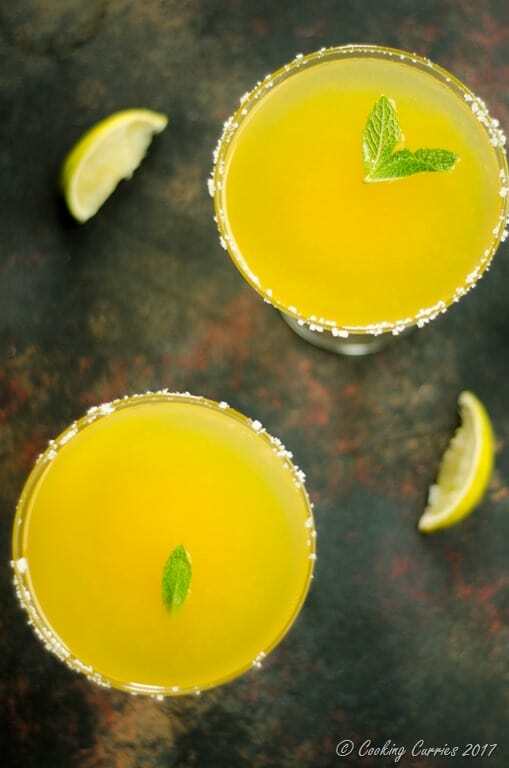 Mango, mint, ginger and lime comes together in this refreshing Mango Margarita, that will be a favorite for your Cinco de Mayo and summer parties! Mango always have a special place in my heart. Growing up in India, summer holidays meant eating lots of mangoes and jackfruit! Even though the mangoes you get here in the US are not anywhere close to the delicious fragrant sweet mangoes in India, we have to make do with it and make the best of it. That said, of all the mangoes you get here, the Ataulfo ones from Costco are the best and a favorite in our household. Muddle the mint leaves and ginger together in a cocktail mixer. 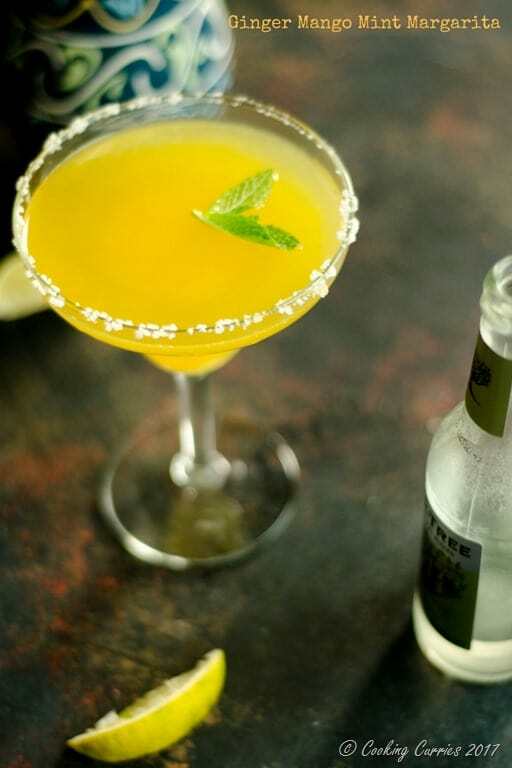 Add the triple sec, tequila and mango puree to it. Wet the rim of the margarita glasses with the lime and dip them in salt. Squeeze the rest of the lime into the mixer. Shake well. Strain and divide into the four glasses. Top with chilled ginger beer. Serve immediately. 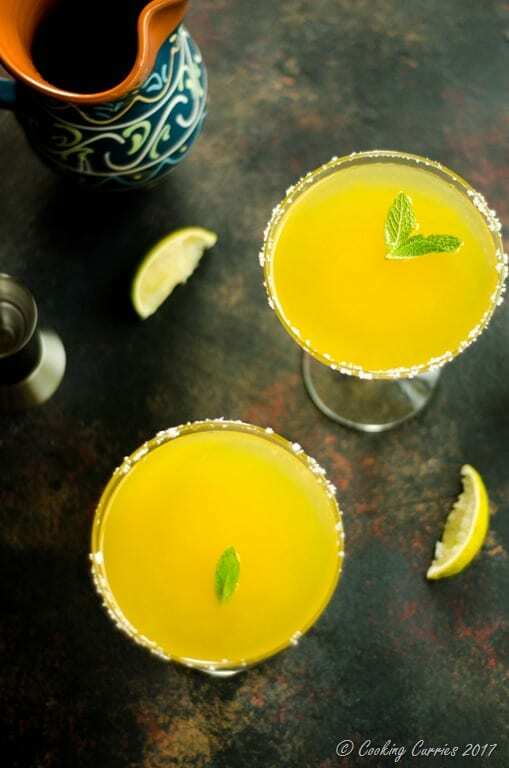 Mango, mint, ginger and lime comes together in this refreshing Mango Margarita, that will be a favorite for all your summer parties! So glad it is getting warm out so I can make this drink. Love mangos. 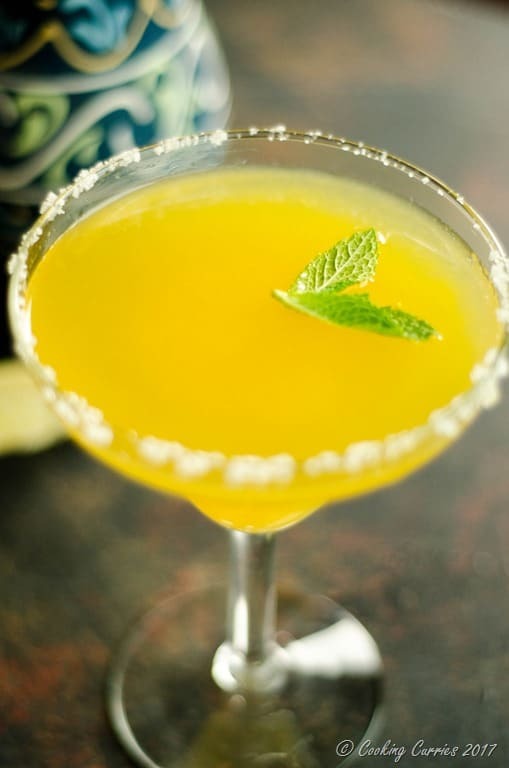 Just posted a recipe for chile lime shrimp tacos on Inspiring Kitchen which would go so well with this drink. Thank you!! Those shrimp tacos sound amazing! You have all the skinny for mango deliciousness! Mangos are one of my favorite fruits. I can’t imagine how wonderful they must be in India, because they are super yummy already, totally jealous! 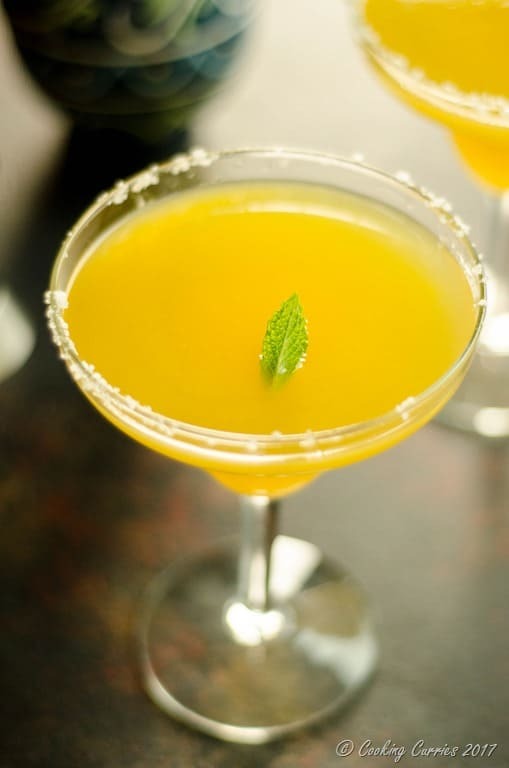 Definitely would love one of your delicious cocktails – cheers! This recipe is so amazing! !love mangos, but usually I just make smoothies with them…I’ll might propose it to my guests for my birthday party in June, sure it would be a hit! Thank you! I hope you and your guests love it! it’s the season of mangoes here !! Easy and simple to make at home if one has good quality and branded juicers.